The polycrystalline Ni53Mn23.5Ga23.5 ferromagnetic alloy was synthesized by high-pressure method. The Ni53Mn23.5Ga23.5 ribbons were prepared by melt-spinning; then, the ribbons were pressed to the bulk samples under the 6-GPa high-pressure and heated to 1173 K for 30 min. The surface morphology, phase transition, and magnetocaloric effect (MCE) were investigated in the Ni53Mn23.5Ga23.5 bulk sample. Structural analysis and magnetic measurements studies of the bulk samples revealed the martensitic transformation at room temperature with a low thermal hysteresis of magnetization, and the nanocrystalline was observed by atomic force microscope measurements. 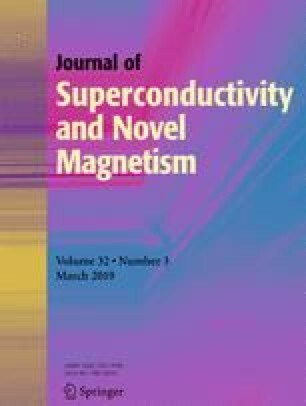 The Ni53Mn23.5Ga23.5 bulk sample exhibits the directionality, and the magnetic properties have the large magnetization and low coercivity when the sample direction of the applied pressure was perpendicular to the direction of the applied magnetic field. The maximum entropy changes (∆SM) of − 4.8 J/kg K have been obtained at 330 K under the field of 30 kOe in the Ni53Mn23.5Ga23.5 bulk sample. This work was supported by the Cooperative Innovation Center Project of Shanxi Advanced Permanent Magnet Materials and Technology (2016-09); Talent Training Project of Joint Training Base for Graduate Students in Shanxi (No. 2016JD36); Key Team of Scientific and Technological Innovation in Shanxi Province (No.2013131009); Research Project Supported by Shanxi Scholarship Council of China (No.2013-098); Scientific Activities of Selected Returned Overseas Professionals in Shanxi Province, Shanxi Scholarship Council of China (Grant No. 2016-092); China Postdoctoral Science Foundation funded project (Grant No. 2015M571285); Scientific and Technological Innovation Projects for Excellent Researchers of Shanxi Province (No. 201805D211042).